The Best Western Royal Brock Hotel is located at the corner of 716 Gordon Street and Stone Road. This newly renovated property will offer Guelph and Wellington County the ultimate in luxury that has become expected within the Best Western Family of hotels. Easily accessible from Hwy 401 in Guelph, guests will enjoy the proximity to work and play within the City of Guelph and the County of Wellington. Knowing that today's Traveler is looking for quality, value, and service, The Best Western Royal Brock Hotel and Conference Centre has thought of every detail. With professional, well trained staff, offering complimentary coffee upon arrival, guests will instantly feel at home and this is just the beginning.This Hotel features a large beautiful lobby and cocktail lounge to allow guests the opportunity to relax and mingle with other guests before settling in to their rooms. Guests may then choose to dine at one of the many excellent restaurants in Guelph and area, attend a tour of the Sleeman Breweries, or take in a show at the River Run Centre for the Performing Arts. No matter what the plans, the Best Western Royal Brock Hotel & Conference Centre will have you in the heart of all the action. In the morning, guests will be treated to the Best Western Compimentary Hot Breakfast which includes scrambled eggs a baked goods, and fresh fruits and yogurt.For leisure activities within the Hotel, guests of the Best Western will enjoy the outdoor Swimming Pool and Fitness Facilities. With 104 beautifully appointed Guest Rooms and Suites awaiting our guests in this newly renovated hotel, we can assure you that your guest will find the comfort and quality they have come to expect from the Best western Brand. Our rooms are complete with hypo-allergenic duvets and superior bed linens, ensuring fresh clean sheets and duvet covers every time you check in. Energy Star In-room coffee makers, and bar fridges are also available in each guest room. These details are then augmented with a 32” LCD television, making each room feel like a home away from home! The Best Western Royal Brock Hotel & Conference Centre remains focused on the environment and the community in which it operates.Residents, community supporters and regular visitors to the City of Guelph, will readily recognize the Management of the hotel as well. With Ketan Nagra, as General Manager and Glenn Irving as Front Desk Manager, the Best Western Royal Brock will be firmly entrenched in the community through charitable involvement, and providing community support. These two individuals have been highly involved for numerous years. They each look forward to continuing their volunteer work in the community developing new connections to help the City grow and prosper. Below are the meeting, banquet, conference and event spaces at Royal Brock Hotel. Feel free to use the Royal Brock Hotel meeting space capacities chart below to help in your event planning. 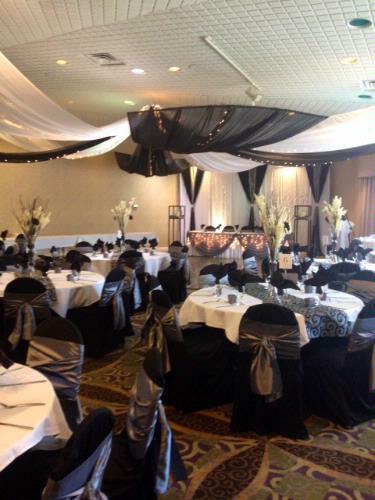 Hotel Planner specializes in Guelph event planning for sleeping rooms and meeting space for corporate events, weddings, parties, conventions, negotiated rates and trade shows. 52 x 45 x 18 Ft.
35 x 35 x 18 Ft.
35 x 22 x 18 Ft.
240 x 240 x 0 Ft.